Sugar Is Not To Blame, Too Many Calories Are! Still convinced that sugar causes fat gain? Sugar is not making you gain weight… CALORIES ARE!! Sugars and carbs are not bad and are not to blame for weight gain…over eating is to blame. Sugar intake has dropped over recent years, while obesity is on the rise. What leads to obesity is a imbalance of energy consumed vs calories expended. Take a look at this graph by Stephan Guyenet, a science consultant with a background in neuroscience and obesity research, based on the latest data published by the CDC (2015) on the prevalence of obesity in the US. As you can clearly see, the results of the report show that, despite US sugar consumption (g/person/day) DECREASING year after year since the early 2000’s, rates of obesity still continue to INCREASE. Once you can understand why you are eating too much then you can get a better grasp of controlling calories. 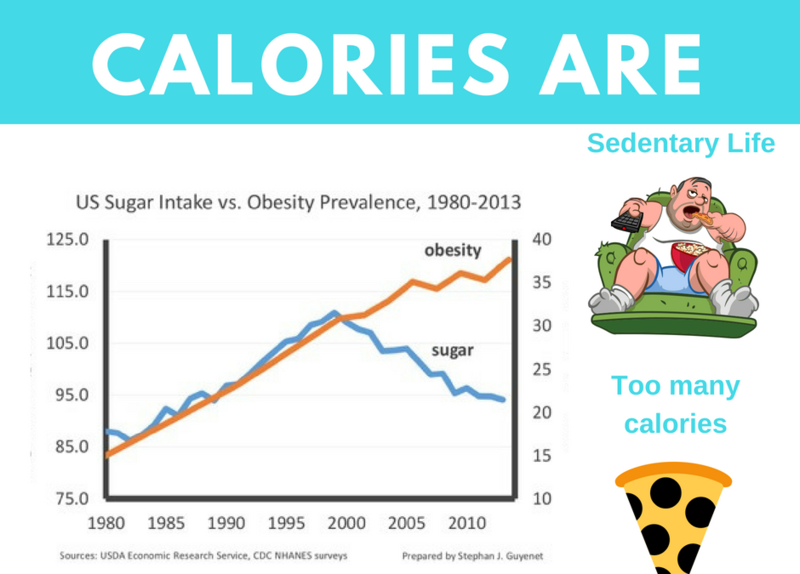 Bottom line: People are eating more and modern day living results in a more sedentary lifestyle.